We shall be travelling on dogsleds through Arctic Finnmark, from the Barents Sea to the Atlantic, a journey of close to 1,500 kilometres in rugged conditions and temperatures ranging from minus 10 degrees C to minus 35 degrees. Euan Cameron is a consultant editor, translator and literary journalist, who has spent the greater part of his working life in book publishing. He grew up in Argentina and was educated in England and France. He will be co-ordinating our website diary, as well as a regular diary in one of the British national papers. He is also developing a book project on the expedition. Tom Frode Johansen our chief guide, is a teacher, hunter and distinguished dog-musher who has raced his dogs all over the North. He has travelled throughout Finnmark, has participated in expeditions to the North Pole with his dogs, as well as in many other expeditions throughout the Arctic. We will be relying on his knowledge of the tundra and the Sámi, amongst whom he counts many friends. We will also be using his dogs. Dr Dessislav Sabev, Anthropologist and Research Fellow from Canada (McGill and Laval Universities) is our chief scientist, and has done a lot of work on indigenous peoples and their economies in transition, with emphasis on reindeer management for sustainable development. He has led or assisted in diverse international projects on globalisation and climate change in the north; amongst other places, in NW Russia on the Kola peninsula with the Sámi, the Komi and Nenets reindeer herders. His publications are numerous. His daughter, Andrea, born on January 8th 2007 will be our expedition talisman! David Sington worked for the BBC from 1987 to 1999 producing 22 documentary films before leaving to form his own production company DOX. Since then he has made 17 films shown on the BBC, Channel 4, PBS in the US and in 22 other countries. His films on climate change have won him a Gold Hugo, 2 Wild Screen awards, 2007 Earthwatch film award, and the World Audience Award at the Sundance Film Festival 2007, amongst others. Johan Mathis Turi is a Sámi reindeer herder and is Secretary-General of The Association of World Reindeer Herders as well as Chairman of the Resource Centre for the Rights of Indigenous Peoples. Johan Mathis has great knowledge of reindeer-herding practices throughout Finnmark. Related to many of the oldest herding families, he is also the great-nephew of Johan Turi, a legendary Sámi hunter, artist, anthropologist, and writer, whose book “Turi’s book of Lapland” first brought the world’s attention to the Sámi, at the beginning of the 20th Century. Marja Kuhmunen is a post-graduate Sámi student studying for her doctorate in Northern and Southern Sámi languages at Umeå University. She is working to develop techniques for better understanding and use of traditional indigenous knowledge, and comes from a long line of reindeer herders. She still spends regular time with the family Siidda where she participates regularly in the seasonal migration of the herds. Ellen Anne N Siri is a young reindeer herder, a veterinary nurse (so we now have a travelling medic), and a massage therapist. Ellen comes from an old family of herders in Kautokeino, the herding centre of Sapmi. * to discuss related issues ( problems of secondary education, young male and female Sámi challenges, issues of identity), with old and young representatives. We hope to enhance visibility of the Sámi communities’ role and precariousness within the global system, and to contribute to international efforts to increase human security in the context of climate change. Under the aegis of the Royal Geographical Society, London, our expedition has been scheduled to start with the opening of the International Polar year March 1st. 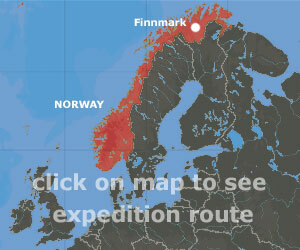 NASA have requested that the Finnmark 2007 expedition team conduct data gathering along the 1,500km route. The data gathering is part of the Global Snowflake Network - the serial collection and identification of snowflake shapes and "riming" details to assist in polar and winter meteorology study. The team have been supplied with a kit for measuring temperature, as well as a chart to document the range of snow crystals and the GPS position of each sample. The results will also be communicated in the Diary section of the website and form part of the Education section of the website.